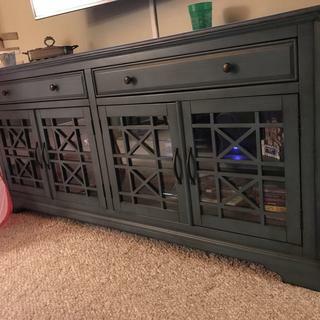 This Antique Blue Media Unit is a classic addition to your entertainment room. The adjustable shelves behind the glass doors allow you to organize media components like CDs, DVD players, video games and more. With pattern detailing on the doors and rugged hardware, this transitional-style media unit will add character to any room. This media chest also has two functional drawers for hidden storage. Drawers with smooth glide system and heirloom-inspired knob allow easy opening and closing. The beveled cabinet top can accommodate any flat screen TV. Available in other finishes. Overall color and look is great, however our unit has a few smaller issues that are disappointing. One of the doors is not hung quite square, and another has a broken piece as part of the wood design over the glass. There is also a small chip on the wood under a door. These are fairly small but are not up to expectations based on price and general quality of the cabinet. It was just what I was looking for and the price was right. I would recommend this console ! I have this console in my living room, looks great hold all of my components . Janine salesperson is the best!! !knows her stuff and very personable!!! I had been looking for a China server to use in my dining room. It was impossible to find something to match the wood of my table and chairs so decided to get this beautiful blue piece to act as an accent piece. It stores my China perfectly! The storage is great, lots of compliments on it, it is large, so it can hold a lot, great for our kids play room. One our favorite pieces in our house! We purchased these piece for our media/family rooom. Our decor is a nautical theme with rustic tones. This price couldn't fit more perfectly for the room if it was customer designed for the space. Our TV components are stored underneath allowing me to have nice displayed items on top such as a coral reef bowl and driftwood. Everyone tells us it's beautiful.